LOS ANGELES (AP) — The way the Portland Trail Blazers kept fouling DeAndre Jordan down the stretch in a feeble attempt to rally from a double-digit deficit was enough to turn anyone’s stomach — Damian Lillard notwithstanding. 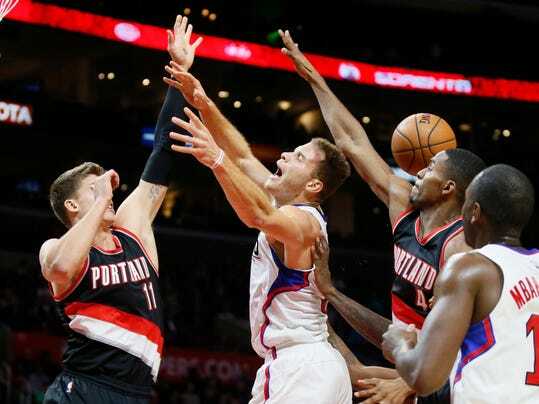 Portland sent Jordan to the free throw line nine times in the final 3:51, and the Clippers’ center missed 10 of 18. But it didn’t help the cold-shooting Blazers, who finished at 37.9 percent as Los Angeles beat them 102-87 on Monday night. Jordan had a season-high 24 rebounds to go with 18 points, and Blake Griffin scored 23 to help the Clippers win their third in a row. The 34 free throw attempts by Jordan was a Clippers record. Lillard, who leads Portland with a 25.4 scoring average, left the game because of abdominal pain with 10:13 remaining in the third quarter and the Blazers trailing 53-51. He finished with seven points and no assists in 17 minutes.